Our Diamant Tile stencil is inspired by a classic geometric encaustic cement tile design, which is both classy and timeless. This cement tile stencil is perfect for creating a gorgeous painted tile floor, kitchen tile backsplash, accent wall or even a faux tile table top! With our tile stencils, you can create a dramatic tile floor on a budget and save big on bath and kitchen renovations! 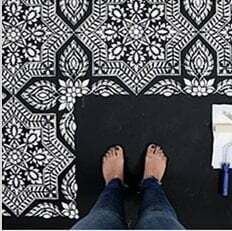 No need to rip out your old tile, as you can stencil right over it. Just imagine the savings! You can use this versatile tile stencil in two ways: with the smaller "diamond" and without it! If you like to omit the smaller diamond from the stencil pattern, simply mask it out with pieces of blue painter's tape. Our images we show both versions of the stenciled tile: with and without the extra diamond. Our stencils are laser cut from 10 mil mylar to the highest industry standards and with proper care and storage will serve you for long time.